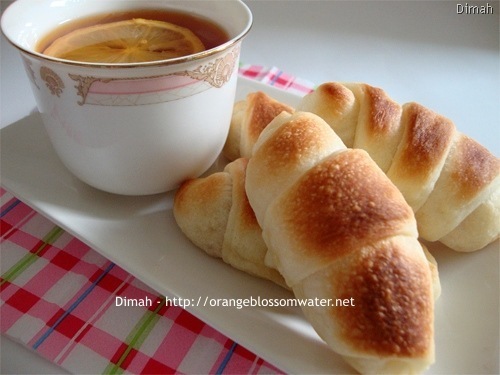 These rolls are perfect for breakfast with a cup of tea. The filling is Nutella in the original recipe, but I used Apricot jam and Strawberry jam. 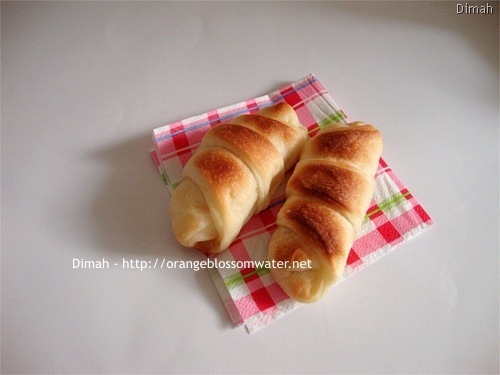 Next time, I’ll use the same dough and make Cheese rolls and Za’tar rolls. 1. 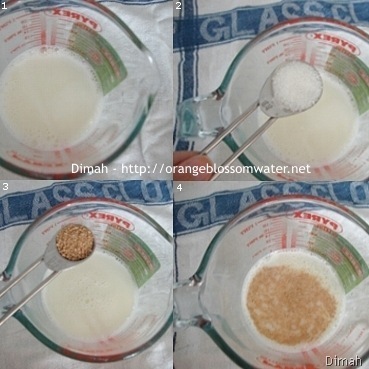 Mix together water and milk, and warm it up a little. 2, 3, 4. Pour into mixing bowl, add 1 tsp of sugar, and yeast. Let sit for few minutes. 5, 6. After the yeast sit, add oil, 1/4 cup sugar, and salt. 7. Start adding flour a little by little until you have bread like dough. 8. Cover, and let it rise until doubled. 10. Now knead and transfer to a floured surface. 11. 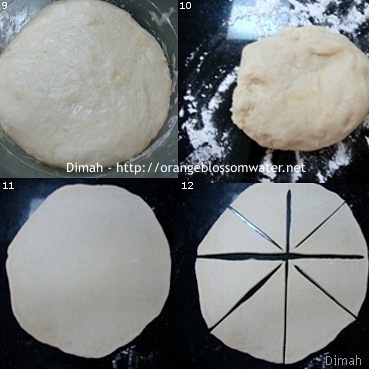 Divide the dough into 2 balls, and roll each of them into a diner plate sized circle. 12. Cut into quarters, and then cut each quarter into 3 rolls to be ( I cut each quarter into 2), You get 12 (I got 8 rolls), Repeat with the other ball of dough. 13, 14, 15, 16, 17, 18. 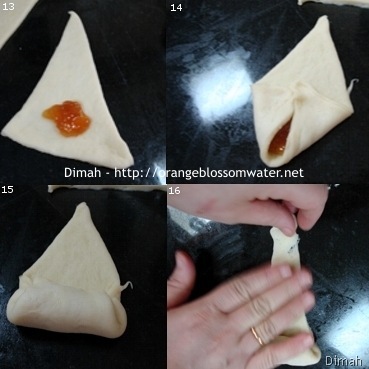 Put a little jam in each (I used in the picture apricot jam), and roll it up. 19. Brush with some butter (I softened the butter and brush the rolls using my hand), ake at 380 °F (193 °C) for about 20 – 25 minutes, or until golden. Mix together water and milk, and warm it up a little. Pour into mixing bowl, add 1 tsp of sugar, and yeast. Let sit for few minutes. Then add the oil, 1/4 cup sugar, salt. Start adding flour a little by little until you have bread like dough. Cover, and let it rise until doubled. Now knead and transfer to a floured surface. 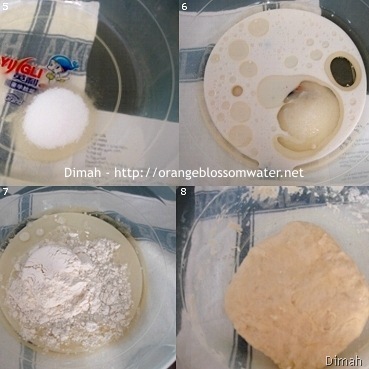 Divide the dough into 2 balls, and roll each of them into a diner plate sized circle. Cut into quarters, and then cut each quarter into 3 rolls to be ( I cut each quarter into 2), You get 12 (I got 8 rolls), Repeat with the other ball of dough. 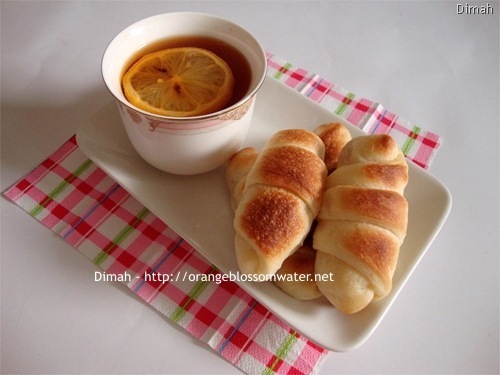 Put a little jam in each (I used in the picture apricot jam) , and roll it up. Brush with some butter (I softened the butter and brush the rolls using my hand), Bake at 380 °F (193 °C) for about 20 – 25 minutes, or until golden. You can choose your favorite filling for these rolls. The original recipe used egg yolk wash to brush them after rolling (I didn’t use it because I don’t like the smell of eggs). and the original recipe used about 1/2 tsp of butter on top of each roll, I brushed the rolls using the butter. You can sprinkle the rolls with sesame seeds or Nigella seeds. This entry was posted on Tuesday, November 3rd, 2009 at 2:56 AM	and is filed under Baking and Desserts. You can follow any responses to this entry through the RSS 2.0 feed. You can skip to the end and leave a response. Pinging is currently not allowed. 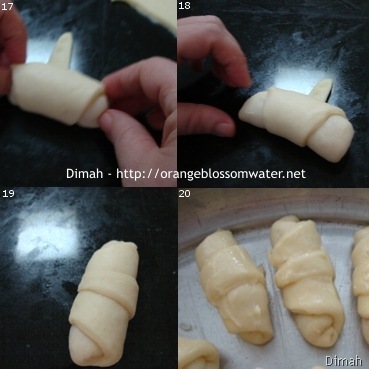 Mabrouk Dimah for your new site ! 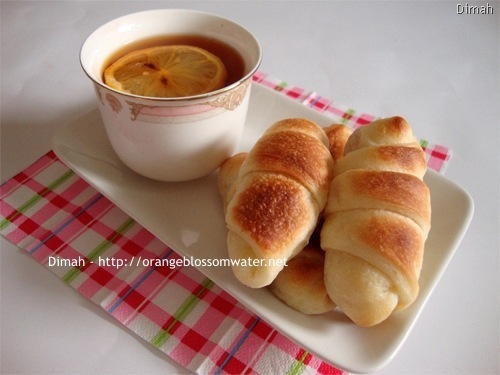 These rolls look delicious! They seem fairly easy to make too, I love homemade bread. Congrats on the new site! Your rolls look fantastic! The jam fillings sounds great. The rolls look amazing! I completely want to make these! Maya: Thanks for visiting! I didn’t try to freeze them. lisa @dandysugar: Thanks for your kind words! I love the smell of homemade bread. lisaiscooking: Thank you for coming by! Sook: Thanks for stopping by and for the lovely comment!